The theory of the flexural strength and stiffness of beams is now attributed to Bernoulli and Euler, but developed over almost 400 years, with several twists, turns and dead ends on the way. Galileo Galilei is often credited with the first published theory of the strength of beams in bending, but with the discovery of “The Codex Madrid” in the National Library of Spain in 1967 it was found that Leonardo da Vinci’s work (published in 1493) had not only preceded Galileo’s work by over 100 years, but had also, unlike Galileo, correctly identified the stress and strain distribution across a section in bending. The relevant page is Folio 84, reproduced below. 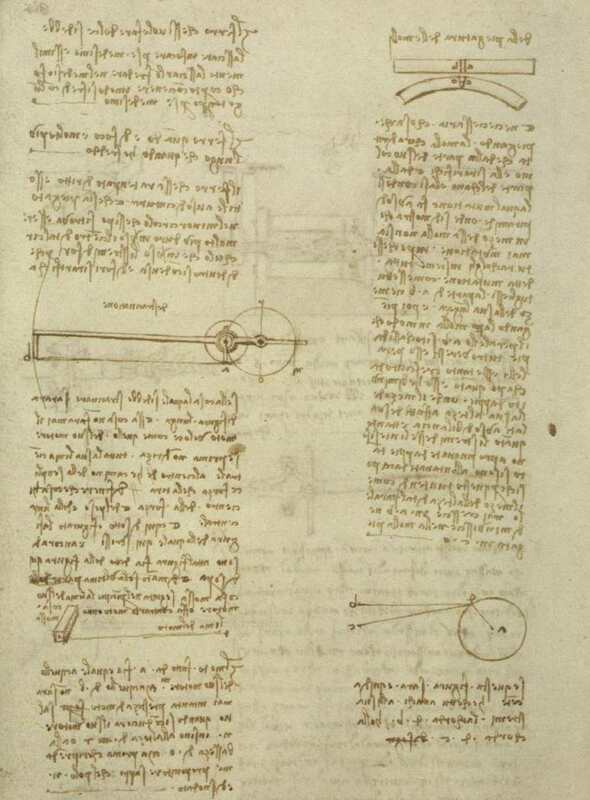 In spite of Leonardo’s accurate appreciation of the stresses and strains in a beam subject to bending, he did not provide any way of assessing the strength of a beam, knowing its dimensions, and the tensile strength of the material it was made of. This problem was addressed by Galileo in 1638, in his well known “Dialogues concerning two new sciences. Illustrated with an alarmingly unstable looking cantilever beam supported by a wall, Galileo assumed that the beam rotated about the base at its point of support, and that there was a uniform tensile stress across the beam section equal to the tensile strength of the material. From this he derived a bending strength equal to the tensile strength of the beam multiplied by half its depth. Due to the incorrect assumptions of uniform stress across the section and rotation about the base of the section Galileo’s result was three times higher than the correct value for a brittle material which has approximately linear behaviour up to its failure load. 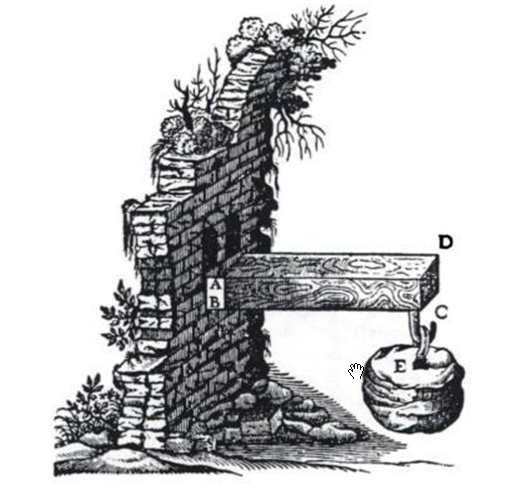 The disparity between Galileo’s calculations and actual breaking loads did not go unnoticed, and in 1686 Edme Mariotte’s alternative approach was published. Mariotte initially retained Galileo’s position of the axis or rotation, but proposed a triangular stress distribution, varying from the failure stress at the top to zero at the base. He then proposed (without proof) that the neutral axis should be at the centre of the section, but also introduced an error in his working resulting in the section modulus being double its correct value, as it would be if the neutral axis were at the base of the section as he had initially assumed. The correct formula was eventually derived by Antoine Parent in 1713 who correctly assumed a central neutral axis and linear stress distribution from tensile at the top face to equal and opposite compression at the bottom, thus deriving a correct elastic section modulus of the cross sectional area times the section depth divided by six. Unfortunately Parent’s work had little impact, and it was many more years before scientific principals were regularly applied to the analysis of the strength of beams in bending. This entry was posted in Beam Bending, Newton and tagged Antoine Parent, Beam Bending, Codex Madrid, Edme Mariotte, Galileo Galilei, history, Leonardo da Vinci, theory. Bookmark the permalink. I found this fascinating – thanks for posting it. It seems so obvious now, but it’s amazing to think that someone thought “the center of its height has become much like a balance for the sides” hundreds of years ago. Reminds me that I have to finish the story (from Euler to the present day)! This as well as the parts 2 and 3 are really fascinating to read. Reading between the lines, I presume that “thinner” means contracting and “thicker” implies stretching. If that is so isn’t there a contradiction? When a beam bends the convex part stretches and the concave part contracts. I will be happy to get clarification. Thanks. Raghu – I agree, it doesn’t seem right. I don’t know what the explanation is. It is possible that the translation is misleading, but my Latin is not good enough for me to know (especially when the original is in mirror writing script!). Your reply was as fast as lightening. Thanks. I feel this “contradiction” has to be investigated. Curiously, I have reasons to believe that I am not the first one to point out this contradiction. “concave is hollowed or rounded inward like the inside of a bowl and convex is the curving out or bulging outward, as opposed to concave. Ghostdog – but why do you say that “thicker” is compression? When you compress a spring you make it thinner. It makes sense if you consider also Poisson’s ratio and a fabre under stress.